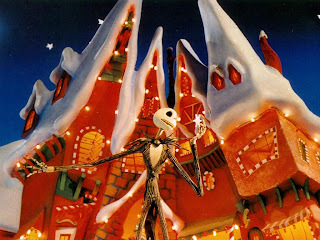 Blu Ray Review: "The Nightmare Before Christmas"
After another successful holiday, Halloweentown's discontented super-scarer Jack wanders aimlessly out of town and unwittingly happens upon a door to another village. This place, known as Christmastown, is much different than his own home and he begins to pine for something different. When he returns home, Jack starts his own Christmas that invitably falls short, leading to an abduction of Santa Claus and some ensuing chicanery. Somehow I've never seen this twisted animated feature despite its stellar reputation. I've got a love/hate relationship with Tim Burton. Some of his stuff is incredible and some of it is terrible. "Batman" great, "Planet of the Apes" terrible. "Alice in Wonderland" solid, "Beetle Juice" blerg. I guess that's the case with anybody but I feel like many directors are more predictable as to how I'm likely to feel about their films after seeing them. Still, Burton's style is entirely his own and he is a unique visionary, even if his visions are often creepy and weird. Burton didn't direct "Nightmare" but his finger prints are all over it. "Nightmare" is a solid outing but I'm not as into it as so many other people are. The visuals are excellent, the musical portions are great, and there's a definite entertainment value. But if I'm being honest, I was easily distracted from what was taking place on screen. Despite my ADD tendencies, a 76 minute animated movie shouldn't lose my attention (and interest?). I got bored between songs and drifted away to whatever was happening on Twitter and Facebook and that left me feeling just okay about "Nightmare" as a whole. Maybe my feelings would be different if I'd seen this in a theater or perhaps I'm not really the target audience. Either way, I'm not totally sold.